but installs easily and is comfortable to walk on! It has to be comfortable to walk on. that doesn’t get hot to the touch. knee or tear a swim suit. furniture to rock and roll. It can also stump toes. pad with a mortar joint. Use a surface that is easy to clean. difficult to sweep or blow clean. patterns. It is installed completely dry, no mortar. surface. It is an asset to your landscape design! 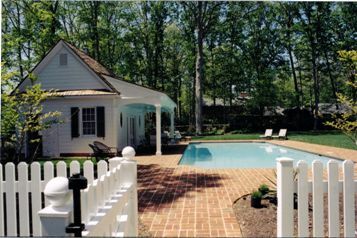 Brick makes an elegant pool deck. It gives a formality to a landscape design. want a dramatic, dark deck for your landscape design. This decorative concrete is stamped to look like stone. color is not hot and is nice and smooth to walk on. Standard, gray concrete is still used. 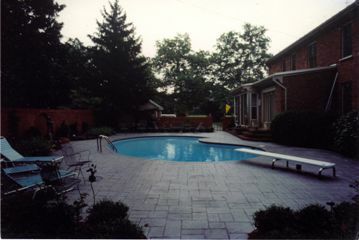 coping on a concrete deck to add interest and style. too rough for bare feet. rectangular and the deck was random rectangular stones. slippery and hot on your feet. seeing it used here. It would be brown and patchy looking. There may be a problem with dirt or grass clippings in the pool. functional addition to your home. 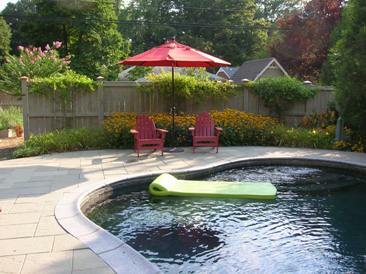 Related Pages: Swimming Pools; Gunite Pools; Vinyl Liner Pools; Fiberglass Pools; Fences; Back Yards and Patios.